Few years ago the IRS scheduled all businesses to make tax payments electronically. Although the individual taxpayers still have a liberty to send payments by mail, they should consider switching to the electronic format. The Electronic Federal Tax Payment System, or EFTPS, lets taxpayers make payments by the Internet or by phone (EFTPS Voice Response System 1.800.555.3453). It is a fast, secure, and convenient way of settling any tax liabilities with the IRS. Name associated with that number. Telephone number and residence address. Bank account information from which the funds will be withdrawn. You will then receive a PIN number associated with the provided information. 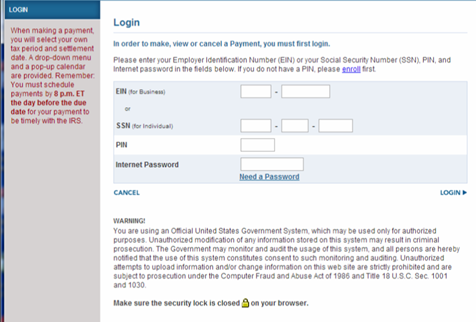 With that you can go to eftps.gov and start logging in. During that process you will set up your unique password that coupled with your pin and social security number (or EIN for businesses) will provide additional layer of protection when accessing your data. What types of tax payments can individuals make? Arguably the most convenient tax payment an individual taxpayer can make is an estimated tax. Whether those payments are done monthly or quarterly, EFTPS allows you to schedule payments in advance (up to 365 days) and do it from the comfort of your place. As long as you schedule a payment by 8PM ET it will go out the next business day. 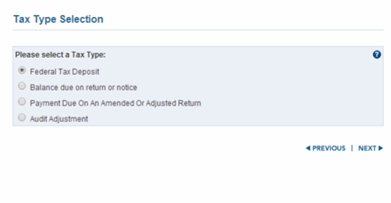 For a complete list of tax types, refer to Publication 4990. In reality EFTPS can assist in making payments of any tax due to the IRS. 1. 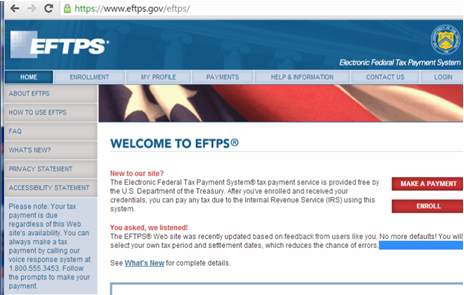 Go to the home page at eftps.gov and click on Make a Payment. 2. You will be taken to your log in screen. 3. 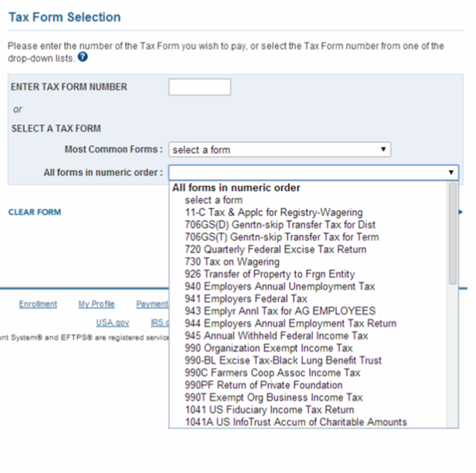 Your fist page after logging in takes you to a form selection. 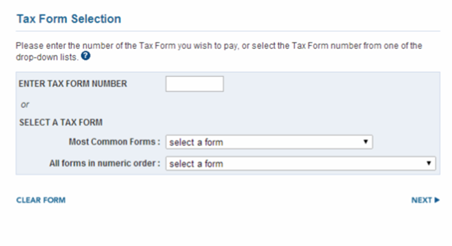 There are two options there: if you know the tax form you are using just enter the number in the box; the second option is to select the appropriate form from the drop down menu (as an example I entered selected Form 941). 4. 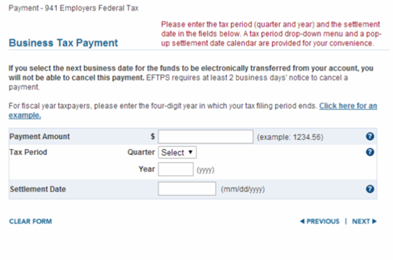 Select a tax type and fill out the remaining information: payment amount, tax period, and settlement date. There is one more screen before the payment is processed that includes subcategory amounts (in case of Form 941) but that information is optional. 5. The last step is a summary page of all the information that you entered. At this point you can select Make Payment and you will receive a deposit confirmation assuming the payment went through. The good thing about this step is that you know whether your payment was accepted or not right away. Save or print payment details for your record and the process is completed.